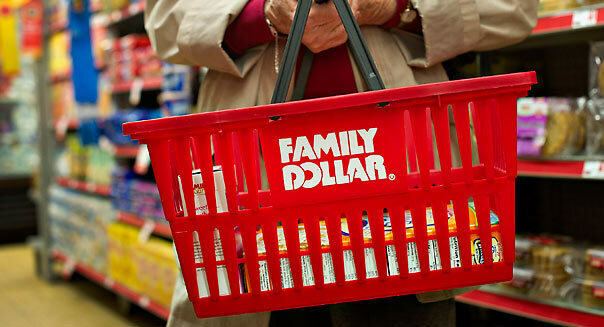 Family Dollar (FDO) says its quarterly earnings rose by less than three percent, falling shy of Wall Street expectations. But the company had plenty of excuses for the shortfall: It blames the economy, the weather, and the delay in tax refunds earlier this year. And Family Dollar doesn't see things getting a whole lot better. It revised its earnings forecast for 2013 significantly lower for the second time this year. But not everything is bleak. Sales rose by 18 percent in the latest quarter, meeting expectations, as the company continued to add stores at a rapid pace. It opened 500 new locations last year and is expected to add that many again this year. It now has more than 7,000 stores. And the sale trend improved in February as customers began to receive their tax refund checks. But analysts say there are bigger trends working against Family Dollar and its main rivals – Dollar General (DG) and Dollar Tree (DLTR). The biggest factor is that Walmart (WMT) has stepped up its competition to win the dollars of hard-pressed shoppers by lowering prices. Family Dollar is trying to make itself a one-stop destination by adding cigarettes, Pepsi (PEP) products, gift cards and magazines. This strategy may draw more customers into its stores, but these are generally very low margin products compared to apparel and other items – and that has pressured profitability. That's in contrast to what happened in recent years, during and right after the recession. Sales and earnings soared as low-income shoppers flocked to dollar stores. Family Dollar has also underperformed on Wall Street. So far this year, its stock is down seven percent. By comparison, both Dollar General and Dollar Tree have gained 15 percent this year. It was just over a year ago that Family Dollar rejected a $7 billion buyout offer from Trian Group, the firm run by activist investor Nelson Peltz. Big-box office supply store Staples has fallen prey to the same trends that have hit other big retailers: Internet competition makes it harder for companies to justify big investments in store locations. Recent mergers in the office-supply space could help Staples in the short-term, but it'll have to boost its own online selling to keep up with competitors in the long run. The agricultural sector has done well lately, but high crop prices mean expensive feed costs for dairy-producer Dean Foods. Moreover, with milk demand having steadily fallen over the past several decades, Dean faces demographic challenges in a declining industry, threatening its future growth prospects. This Connecticut-based savings and loan makes the list largely because of a delayed reaction to the financial crisis. Unlike big banks, People's United made it through the initial phase of the financial crisis intact. But in 2010 and 2011 it finally gave in to pressure that broadly hit the regional banking sector. The stock has rebounded lately but has a long way to go to get back to its former heights. The big-box electronic retailer's woes are well-known, as the company has seen its massive stores become merely showrooms for shoppers to see products up close and in person before buying them more cheaply online. Recent discussions of a possible buyout have lifted shares, but investors are still sitting on long-term losses as Best Buy keeps struggling to find a path to stronger growth. Electric utility Exelon is the biggest producer of nuclear power in the U.S., which traditionally gave it lower costs compared to more expensive fossil-fuel-burning rivals. But with natural gas prices having fallen so far, Exelon no longer has that competitive advantage. That has squeezed margins which forced the company to cut its dividend, leading many investors to flee the stock. Hewlett-Packard has suffered from declines in the PC industry, but a string of leadership changes also hampered the company from coming up with a consistent strategy for growth in the rapidly changing tech industry. Current CEO Meg Whitman has worked hard to reverse her predecessor's miscues. But despite some promising signs recently, the progress has been slower than most investors would like. Defense-contractor SAIC has had to deal with the threat of budget cuts for years. Yet with its intelligence and technology systems, including cybersecurity-related products, SAIC would seem to have a cutting-edge advantage over more traditional military contractors. Still, with bigger competitors muscling in on SAIC's turf, SAIC now hopes that plans to split itself into two separate public companies will help it perform better than it has in recent years. The revolution in smartphones and mobile technology has created many winners in the telecom space, but MetroPCS has largely missed out on the boom. With a substantial presence in low-cost prepaid phones, MetroPCS hasn't gotten to enjoy the popular releases that bigger rivals have used to power their profits. Even a possible merger with T-Mobile may not be enough to let MetroPCS assume a leadership role in the industry. For-profit education companies have been under intense scrutiny from regulators who are concerned about the high loan-default rates for their students. With the potential for restrictions that would stop the flow of federal student-loan money into the industry, Apollo and many of its smaller peers have seen huge share-price declines, with negative publicity helping push enrollment figures down as well. The solar industry has seen a sea change lately, as governments around the world have cut back on heavy subsidies and forced companies to survive on their own to a much greater extent. First Solar's low-cost advantages have actually give it an edge on some harder-hit rivals, but the company needs to boost the efficiency of its products in order to compete better in the cutthroat market. Even when markets are rising, some stocks fall. The key is to look for strength among the companies you invest in, so you can avoid money traps like these losing stocks.